Quite the surprise it was for me, then, when the intro sequence had come to a close and I was finally greeted by the man himself. Leslie Vernon is easily one of the most likeable slashers of all time. He's good looking, intelligent, well-spoken and incredibly talented in a variety of ways. At times he comes off as self-centered or judgemental, but throughout the film remains extremely sociable and very fond of the spotlight put on him by our protagonist, Taylor Gentry. This is in sharp contrast to the trope of serial killers being cold and introverted. The majority of the film is played for laughs, with the occasional reminder that what we're laughing at is actually stalking and murder and that for all his grace and charm, Leslie is a psychopath. The humor is often directly in reference to classic horror movie tropes such as the virgin survivor and the phallic symbolism of bladed weapons, and as such remains fresh and relevant today. What's more impressive is that most of the comedy still hits home and makes me laugh even after a dozen or so viewings over the last decade. Behind the Mask is frequently called "a love letter to horror movies," and is considered a companion piece to Adam Green's Hatchet which was released around the same time. On a recent edition of Green's podcast, the director Scott Glosserman joined his long-time friend to provide a commentary track for the upcoming blu-ray release, and until I listened to that commentary I had no idea just how many subtle references were packed into this movie. Of course everybody knows that it features the likes of Zelda Rubinstein, Kane Hodder and Robert Englund, whose character is inspired by Dr. Loomis and named after a character from The Shining. What I had no idea of was the music that was directly re-used from The Shining, or the Lament Configuration in the background of one particular scene. The attention to detail is impressive. The people behind this masterpiece have been trying for years to get a second film going, which they declare is not a sequel or a prequel or a remake, but a Spreemake. 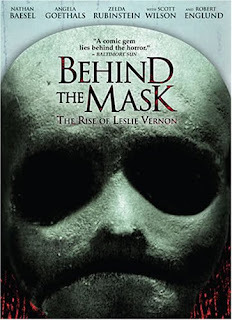 Before the Mask: The Return of Leslie Vernon unfortunately failed its initial crowdfunding campaign, but now the team has set their sights on creating a comic book adaptation of the screenplay. I, for one, can't wait to see it, and I hope that if you have some extra cash, you'll support their efforts to tell the continuing story of Leslie Vernon, the Psycho Killer of tomorrow.